POLITICAL TIDBITS: Hearty congrats to our own Pia Wurtzbach for bagging Miss Universe title and for her advocacy to raise awareness vs HIV scourge. Pia’s victory seems very Filipino in plot and style, full of last-minute suspense and confusion, as emcee Steve Harvey gets all mixed up re top winners. But at least he owns up to his mistake quickly---unlike Smartmatic, now engaged in source-code review that our IT experts denounce as ‘grand thievery.’ Read about racket in foreign duty-free airports that makes NAIA's “laglag bala” seem like child’s play---frightful and chilling. Hearty congrats to our own Pia Wurtzbach for bagging Miss Universe title and for her advocacy to raise awareness vs HIV scourge. Pia’s victory seems very Filipino in plot and style, full of last-minute suspense and confusion, as emcee Steve Harvey gets all mixed up re top winners. But at least he owns up to his mistake quickly---unlike Smartmatic, now engaged in source-code review that our IT experts denounce as ‘grand thievery.’ Read about racket in foreign duty-free airports that makes NAIA's “laglag bala” seem like child’s play---frightful and chilling. Amid the feeling of desperation of the populace over recent political developments, devastating typhoons, traffic, the airport scams, etc., a most welcome and much-needed glimmer of cheer appears in the horizon---just in time for a merry Christmas celebration. Pia Alonzo Wurtzbach, daughter of a Filipina mother and a German father (she was born in Stuttgart in western Germany and is also a former movie actress who answered to the name of Pia Romero), bags the Miss Universe title in the recent pageant in Las Vegas---42 years after Margie Moran won it. But to make Pia’s victory more exciting---very Filipino in plot and style, in fact, full of last-minute mix-up, suspense and confusion---pageant emcee Steve Harvey of "Family Feud" fame, erroneously announced that Miss Colombia, the first runner-up, had won the title (which would have made Colombia the consecutive two-year winner). Within minutes, however, Harvey realized his mistake and called out an astounded Pia Wurtzbach---a stunning standout in an electric blue gown by Albert Andrada---as the real winner. 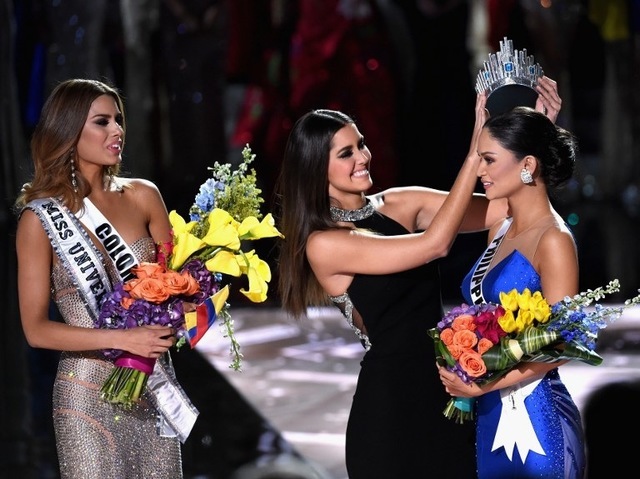 The cameras fully capture the swirling emotions of the cast involved, most especially our Miss Philippines who at first didn’t quite know how to handle the erstwhile winner from Latin America who had to be uncrowned right there. As Harvey acknowledged his embarrassing mistake and apologized profusely, real winner Pia went up to the runner-up to perhaps console her, but the latter turned away, perhaps too emotionally distraught (can anyone blame her?). The cavernous hall, full of flag-waving Pinoys, burst into thunderous applause for Pia. Those who know Pia Wurtzbach stress that her key advocacy is to promote HIV awareness, which is wonderful, for statistics bear out that this world-wide scourge is now prevalent even in our own country. Also, it’s good to know that Pia’s beauty is all hers---a genuine gift of Mother Nature. As someone who knows her says, she has done nothing by way of a repair job, though she had to lose some 25 lbs. for the competition. This Filipino-German beauty indeed represents the best of our multi-racial strains over the centuries that have made the Filipina by now legendary for her beauty. At Last Vegas today Pia added terrific grace, poise and composure to the battery of winning Filipina attributes---despite the hostilities she experienced from sympathizers of the dethroned Colombian girl. Pia looked every inch a queen as she never lost her dignity. As I listened to the news and thrilled to the rectification by the harassed emcee of his mistake, the thought suddenly came to my mind: at least Harvey made a manful, honest confession of it. I couldn’t help but think of Smartmatic, the provider of election machines for our past two elections and already contracted for the 2016 elections, and how it has failed to rectify the grave injustice to the Filipino people of stealing their votes---or at the very least, refusing to acknowledge its grievous sin of failing to give us clean, honest and credible elections. At this point, the Filipino IT practitioners are again unanimous in denouncing the on-going review of the source code for those machines, as required by RA 9369, the Automated Election System (AES) Law. Our IT experts have devoted enormous time, resources and energy to detailing the hideous aspects of the AES and the company repeatedly contracted to provide the machines for it. Smartmatic, however, has been so influential with the powers that be that the IT experts’ opinions---as well as efforts of former Biliran Rep. Glenn Chong who, after being cheated in the elections of 2010 in his province, has made it his life advocacy to document and spread the gospel of cheating through the Smartmatic machines---have fallen on deaf ears all this time. Here’s just a sample of the opinion shared by our IT experts, from Professor Toti Casino of Asia-Pacific College: “The on-going source code review is some kind of evidence being concocted by the Commission (on Elections) to be used for their claim of being compliant with the law, though it’s hardly attended by any more notable and qualified reviewers EXCEPT AMATEURS WHO HAVE NO EXPERIENCE IN NATIONWIDE-SCALE IMPLEMENTATION OF THE AES. Even Smartmatic with its discovered failures in 2010 and 2013 tries to make it look as seamless as an ATM installed nationwide; but it’s rather A GRAND SCHEME OF THIEVERY in the AES. Justifying the fraud-ridden 2016 PCOS-AES elections as truthful would depend on who can put up the ante among these operators” (emphasis BOC’s). Mabuti pa talaga si Steve Harvey, unaamin sa pagkakamali niya. Ang Smartmatic, kahit kalian hindi aamin, sa tulong ng sindikato sa loob ng Comelec. If we Filipinos have been riled up over the “Laglag Bala” scams in our country’s premier international airport, it seems that hindi tayo nag-iisa. A newspaper in India reported about another scam that appears to be plaguing the international airport in Bangkok which could be even worse than our native-spawned scam that has made NAIA notorious around the world. This story was also reported by the BBC. The report said that an Indian national was detained in the Thai capital for stealing a box of cigarettes in a duty-free shop in Bangkok International Airport. He had paid for chocolates and a carton of cigarettes, but it seems that the cashier put an additional packet of cigarettes extra into his bag and he thought it was free. The passenger was arrested for shop-lifting and report alleged that Thai police had asked for 30,000 baht for his release. The report also alleged that the Indian national spent two nights in jail and paid 500 baht for an air-conditioned cell, 200-300 baht for each visitor and 11,000 baht for his final release. The report alleged that the police shared the money in front of the victim. Moreover, he was charged in court and fined 2,000 baht by the magistrate, handcuffed and escorted to his plane. But what made it even more terrible was that his passport was stamped "Thief". His relatives requested help from the Indian Embassy and were told that it's helpless, as many Asians are victimized similarly daily and letters and phone-calls to Thai authorities are ignored. The report alleged that the passenger shared a cell with a Singaporean the first night who paid 60,000 baht for his release. The second night it was a Malaysian national who paid 70,000 baht. The media advisory stressed that the episode had happened not in a shanty shop in downtown Bangkok but in a duty free shop at the Bangkok Int'l Airport and there were corroborating testimonies from various victims. But apparently the scam is not limited to that airport, as someone else went through the same ordeal in Dubai. A Duty Free attendant put a bottle of cologne in his shopping bag (he did not even see it happen) and he was arrested for stealing, before he even picked up his luggage. The report said this passenger sat at the airport jail the whole day---NO FOOD, NO WATER for one day and only after he paid a fine (bribe?) of US$500, all he had in his pocket at the time, was he let go. The report emphasized that all of these episodes appear pre-planned--- some duty free employees intentionally put extra items to victimize passengers---and they know whom to target. The advice is: ALWAYS GET A RECEIPT FOR ANY FREE GIFT THAT THE DUTY FREE SHOP GIVES. One should also be WATCHFUL WHEN YOU ARE BEING BILLED AND ITEMS PACKED IN INTERNATIONAL AIR PORTS (DUTY FREE SHOPS). My own comment: a dilemma like the above that seems to be happening in various airports could really be scary for any traveler, especially if he or she is down to his last few bucks while in some transit airport, and the scammers won’t take anything but cash, so that a credit card would be useless. Of course, there's the ATM, but not all passengers have that access.